The following manual which is only authorized for distribution to “U.S. government agencies and their contractors only due to the sensitive nature of information contained in the manual” was obtained directly from the official, public U.S. Army publications website. Multi-Service Tactics, Techniques, and Procedures for Installation Emergency represents a significant renaming and revision to the November 2007 publication Multiservice Tactics, Techniques, and Procedures for Installation CBRN Defense. It expands the scope from chemical, biological, radiological, and nuclear (CBRN) defense to all-hazards installation emergency management (IEM), including the management of CBRN events. This publication defines the roles of Department of Defense (DOD) installation commanders and staffs and provides the tactics, techniques, and procedures (TTP) associated with installation planning and preparedness for response to, and recovery from, hazards to save lives, protect property, and sustain mission readiness. 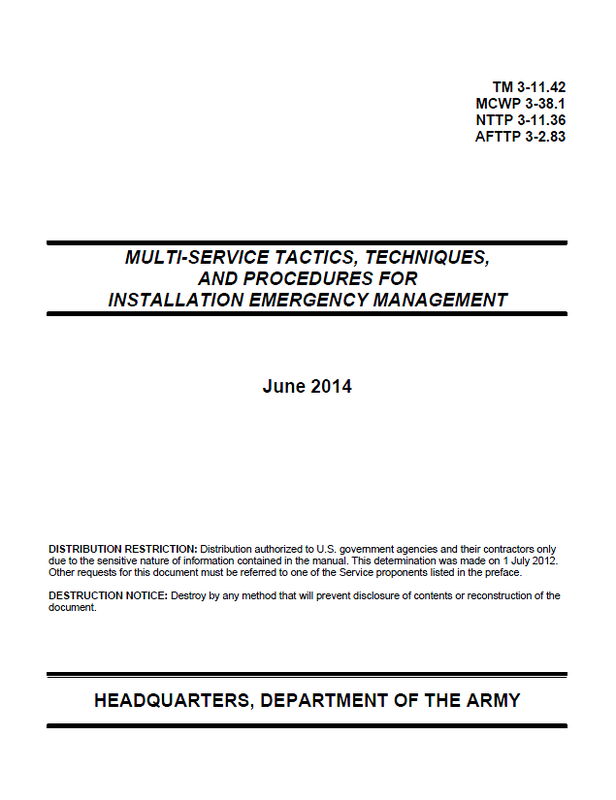 The purpose of this publication is to summarize existing policies, responsibilities, and procedures for IEM programs at DOD installations worldwide for all hazards, as defined by DODI 6055.17, and to translate this policy into tactical terms applicable to military installation commanders. The contents have been written to complement Service IEM program manuals, standard operating procedures (SOPs), response standards, training support packages, collective task training development products, training center and unit exercises, and Service school curricula related to IEM. The explosive safety quantity distance arc. A prescribed 10-mile radius of a nuclear power plant emergency planning zone. Ensure that the EOC is located in an area where it can be secured. Identify site perimeters, perimeter barriers and fences, control gates, and other means of securing site perimeters. Make soil bores to determine subgrade conditions that could impact EOC survivability in a disaster incident. Identify where the command administration is located, and provide access for military command personnel to the EOC. Identify the location of emergency response and support services including law enforcement (LE), fire, medical, transportation, public works and engineering, munitions range control, and other relevant support services. Locate the EOC where congestion will not hinder access and where other contiguous facilities cannot impair EOC functions. Locate the EOC where radio and other communication systems can operate most advantageously, have the most coverage, and are away from radio interference such as power lines and tall metal structures. Verify that the site has an adequate area for the EOC building, required setbacks, and parking. Determine the type of available parking (surface versus garage) and if the parking can be secured. Determine if the site can accommodate helicopter access. Identify flight paths near the EOC site. Identify nearby active commercial, private, and military airports. Ensure that the EOC is not exposed to overhanging trees or forest from which wind-blown debris can strike the EOC. I-1. Mass care operations include meeting the needs of a displaced population by providing access to a shelter or safe haven, food and water, emergency supplies, emergency pharmaceuticals, and other goods from the time they are displaced until the time they return to the original residence or workplace. Sheltering can occur at civilian community shelters, at local or remote safe havens (on the installation itself or on a remote installation), or in a SIP scenario. I-2. Mass care also includes continuous communication to evacuees throughout mass care operations. In particular, up-to-date information is continuously provided to the displaced population about shelter locations, transportation options, mass feeding operations, points of distribution for emergency goods and pharmaceuticals, the evolution of the incident, and the extent and duration of displacement. Assistance center on the installation. Local safe-haven operations consisting of one or more facilities on the installation. Coordination with one or more civilian shelters provided by one or more civil jurisdictions. Remote safe-haven operations at one or more predesignated, geographically remote receiving installations. Mass feeding operations at one or more locations on the installation. Point of distribution (POD) operations for the distribution of goods and services at one or more locations. Installation call center (or information hotline) operations for the distribution of approved information to friends and family of evacuees, casualties, and fatalities. Preexisting hazard-specific shelter locations (tornado shelters, fallout shelters). I-4. Agreements with civilian authorities are established, when possible, to assist the installation population with mass care at local civilian locations. On the installation, basic mass care operations are also coordinated by organic assets, such as community assistance centers or family assistance centers that are usually directed by the department of morale, welfare, and recreation. Fleet and family support centers onboard Navy installations also have organic mass care capabilities that can be leveraged during an incident. I-5. For information on mass care, including mass feeding, see ESF 6 in the NRF and FEMA CPG 101. The American Red Cross disaster services program also has several helpful resources that are available online. Registration, tracking, and personnel locator assistance. Access to sanitary facilities, potable water, food, and sufficient lighting. Medical triage and information on available medical services. Family assistance center to integrate victim and family services. Behavioral health support and psychosocial services. Support services for special needs populations, including medical needs. Support services for animal needs. Communication about services available and the nature of the incident. Coordination with casualty and mortuary affairs. I-7. Local safe havens are generally only capable of providing temporary mass care for 5 to 7 days. After 72 hours (or less depending on the incident and the preparedness of the community), these temporary safehaven residents are completely dependent on mass care operations for feeding, emergency supplies, shower and sanitary facilities, laundry services, and even clothing. Remote safe havens vary significantly, and the associated timeline for transition to temporary or permanent housing depends on the capabilities of the receiving DOD installation. During this period, it is imperative that installations quickly identify temporary housing, on- and off-post and if available on nearby DOD installations in which to relocate safe-haven residents. Constant, honest engagement with safe haven residents on the process and the expected timeline is a key component of the ongoing EPI process. I-8. The safe-haven management team is responsible for the coordination of safe-haven operations. The safe haven management team plans how to accommodate small- and large-scale evacuation operations for people sent to or seeking local or remote safe havens. The general rules for safe-haven operation and special instructions are prepared, distributed, and available in each safe haven. The special instructions include capacity; facility employees and their family members who will seek shelter in the safe-haven facility; a list of preassigned personnel designated to the safe haven; limits of the safe-haven area; proposed layout; and the location of communications facilities, emergency equipment, and utility cutoffs. Telephone directory and emergency communications procedures are also available. 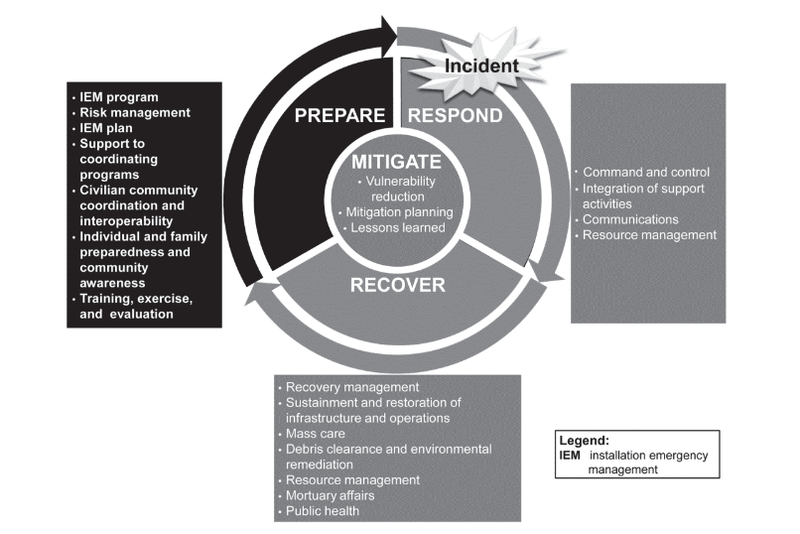 The safe-haven management team works in coordination with the evacuation management team as described in appendix H.